Wandsworth Council last night (Thursday 16 Feb) approved plans for a 15 acre residential and business development in the Nine Elms regeneration zone. 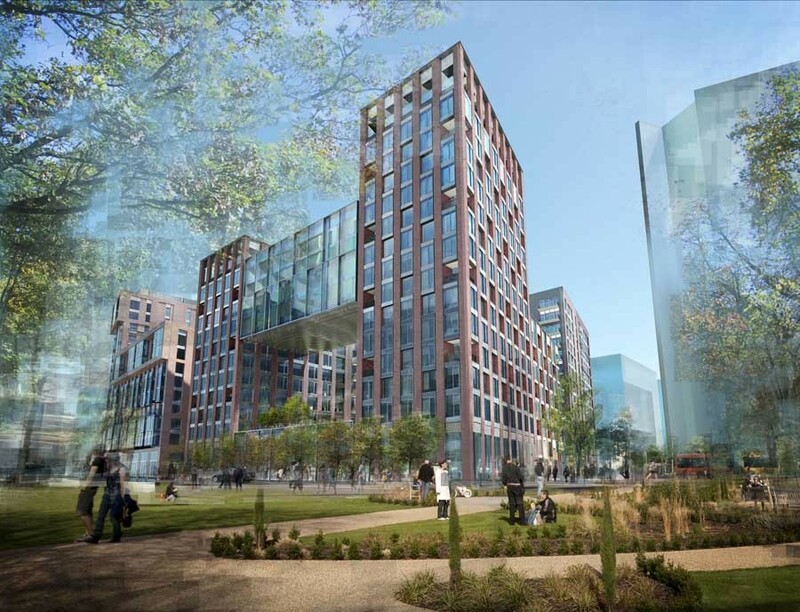 Ballymore’s ‘Embassy Gardens’ scheme would provide up to 1,982 new homes alongside shops, cafes, bars, restaurants, business space, a 100 bed hotel, a health centre, children’s playgrounds and sports pitches. It would also provide more than 6 acres of new outdoor public space including a section of the Nine Elms linear park which will run the full length of the district. The development site is located to the south of Nine Elms lane and wraps around the site of the new US Embassy. As part of the scheme’s Section 106 package Ballymore has agreed to pay between £52.5mn and £55.7mn towards improving local transport and social infrastructure. The exact figure will depend on the timing of the payments and final form of the development. The majority of the sum will go towards the Northern Line Extension which will connect Nine Elms to the tube network. The developer will also provide £200,000 towards an extension of the Barclays Cycle Hire Scheme, £300,000 towards a local employment initiative and six car club parking spaces. The scheme would provide up to 1,982 flats of which up to 298 would be set aside as intermediate and affordable rent homes. If the value of the development improves during the build period the developer has agreed to share up to £40mn of the extra profits with the council. The funds would be used to provide more affordable homes across the regeneration zone. 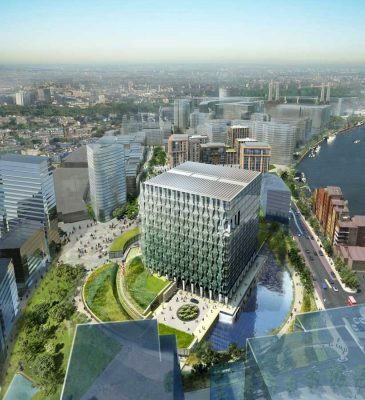 Property agency Knight Frank expects values in Nine Elms to rise 140 per cent by 2016. “Another fifteen acres of industrial land will now be transformed into new homes, offices, shops and green open space. The completed scheme will support thousands of new jobs and is an important piece of the Nine Elms jigsaw. “The development comes with another major contribution to the Northern Line Extension which will cut journey times to the financial district to below 15 minutes. The Embassy Gardens masterplan was designed by Sir Terry Farrell and consists of nine building plots, with individual buildings rising up to 23 storeys in height. The phase one detailed designs were also produced by architects Fielden Clegg and Bradley, Allford Hall Monaghan Morris and FLACQ. To view the Embassy Gardens plans visit www.wandsworth.gov.uk/planning – application number 2011/1815. A planning application has been submitted to Wandsworth Council for the redevelopment of the Market Towers office building in Nine Elms. The proposal is for a mixed use scheme including more than 400 hundred homes, a hotel and a new public square with shops, restaurants and cafés. Called ‘One Nine Elms’, the scheme is a joint venture by CIT and Green Properties. The architect is Kohn Pedersen Fox. Property value is expected to rise faster in Nine Elms than in any other part of London according to property agency Knight Frank. The company has forecast growth of 140 per cent by 2016. London’s first ‘linear park’ will run through the entire length of the distinct. A new and improved riverside footpath will run between Chelsea Bridge and Vauxhall. A new footbridge will cross the Thames linking Nine Elms to neighbouring Westminster. Two new Northern Line stations will connect Nine Elms to the London Underground network and capacity increased at Vauxhall Station. The London plan anticipates up to 16,000 new homes and 25,000 new jobs will be created as Nine Elms changes from a light industrial zone to a mixed residential and business district. The area includes Battersea Power Station which has planning permission for more than 4,000 new homes and a new town centre development.